I hate zucchini. Oh, I used to love it. In fact, it was one of my favorite veggies. But I have a garden now, and it’s cursed with an abundance of the stuff. It started several years ago—this hatred of green squash. When we finally had a yard big enough for a veggie garden, we planted zucchini. And being the citified, wannabe farmers that we were, we planted lots of zucchini. In fact, I think the entire vegetable garden was nothing but zucchini. And our yield that year was approximately 4 billion of the darn things. We gave away as much as we could—but four billion is a lot of zucchini. People started avoiding us in the street, for fear we would make them take zucchini from us. We started making anonymous runs to other neighborhoods, where we’d play doorbell ditch. We’d drop a bag of zucchini on a stranger’s front porch, ring the doorbell and run. After that long, zucchini-filled summer, we stopped planting it in our garden and we’ve been zucchini-free ever since. 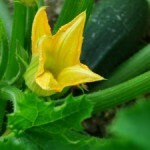 But time has a way of dulling your memories—at least it dulls mine–and this spring, we decided to try zucchini again. So we planted one very tiny plant. We figured we’d be fine. We figured wrong. I admit we were stupid. We didn’t realize that one zucchini plant produces enough veggies to feed a family of twenty on a daily basis. So here it is October and I can’t remember a meal without zucchini. We’ve eaten so much of the stuff that Harry, Junior and I are turning green. I’ve baked it. I’ve sautéed it. I’ve fried it. I’ve made little loaves of zucchini bread—so many that my freezer door has to be duct-taped shut. I’ve stuffed it with sausage. I’ve shredded it in salads. I’ve souped it and mashed it and stewed it. I’ve eaten it raw with dip. I’ve even sneaked a little into Junior’s scrambled eggs. When he tasted it, he screamed in horror. Honestly, I don’t blame him. Even I want at least one zucchini-free meal a day. And yes, I have tried giving it away. But unlike me, there are people in my neighborhood with long memories. And they run the other way when they see me on the street with a bag of zucchini in my hands. So today, I tried the unthinkable. I tried to murder my zucchini plant. I think it knew. I walked out to the veggie garden. And I stopped at the zucchini and glared at it. But it looked so innocent. 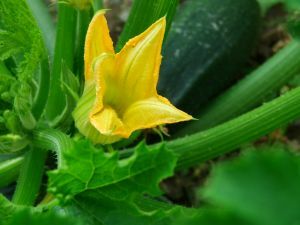 It had little zucchini flowers on it and tiny, newborn zucchini peaked out from the leaves. They looked so…so…delicious. They weren’t old enough to be fried—let alone killed. For a minute, I wavered. Then I remembered that on the counter were twelve zucchini, shiny and green, waiting to be cooked. And I couldn’t take it anymore. I grabbed the plant and I pulled. And I pulled. And I pulled. And absolutely nothing happened. That stupid plant did not budge. I swear, the roots must be all the way to Washington state by now. So I got the pruners and I started to cut. And one little blossom fell to the ground. And I stopped. Because I’m not a plant killer. Heck, I’m not even a zucchini killer. So my zucchini will live to produce a couple hundred more before winter sets in. But if you hear your doorbell ring, don’t rush to answer it. It could be me, dumping some zucchini on your porch. Like me on Facebook or I will leave zucchini on your front porch! I read this with my mom and before I even started, just with reading the title, she already knew what had happened. She couldn’t control her laughing. I think you should start a petition that a place should warn people about zucchini before selling them plants for their garden.